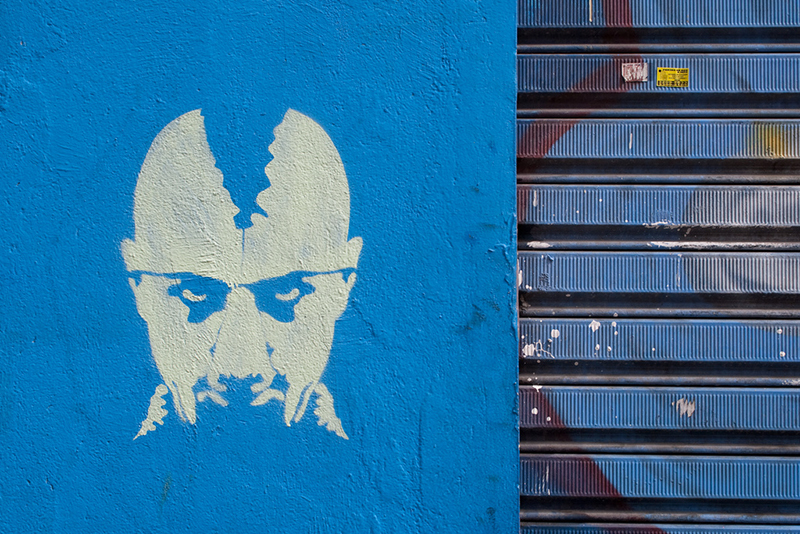 You (Not) Talkin’ to Me? 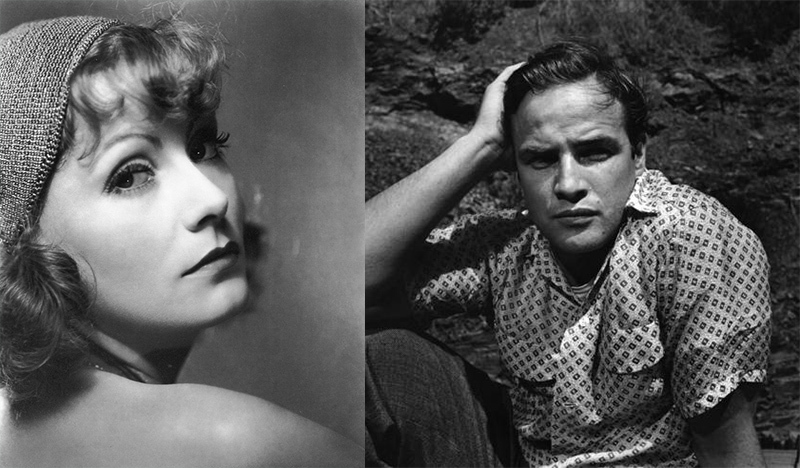 Bernardo Bertolucci once told me that I became an actor to get out certain emotions that I couldn’t get out in life. And I thought about that for a long time and, uh, uh, uh…um…uh…I think that’s right. Yeah, well … I think that … umm…you know… uh-hah. I, uh, can’t, ah, umm … Well, let’s, ah, see uh, I, uh. In any list of all-time most taciturn celebrity interviewees, Robert De Niro would seem to have a lock on a top spot, along with fellow inductees Billy Bob Thornton and the late Lou Reed. Observers are frequently puzzled that De Niro, regularly hailed as one of the most powerful, nuanced actors of his generation, has so little apparent interest in displaying verbal power; as Barry Paris observes in the journal American Film, “It’s ironic that the very thing that draws people to De Niro on the screen — this powerful, largely nonverbal projection of character, emotion and meaning — is what baffles and annoys…people about him offscreen.” But De Niro’s well-known bouts of verbal blockage do not tell the whole story about his relation to celebrity promotion and the performance of a public subjectivity. Indeed, they are representations that do specific kinds of cultural work. As Greg M. Smith perceptively notes, journalists reproduce these inarticulacies, in the way you see them here, on these slides, transcribed literally. “Usually,” Smith reminds us, “a reply in such halting, ‘naturalistic’ speech would be cleaned up, and awkward false starts would be edited out.” Drawing upon recent affect theory that explores so-called “negative,” obstructive affects, I see these moments of inarticulateness as only part of the complex construction of desire and disinclination that I call “reluctant celebrity.” De Niro’s reluctance, then, represents: but how, and what? In the field of celebrity culture, there is a tendency to emphasize the outward pursuit of “happiness scripts” and underestimate its lingering traces of disaffection. We often predicate our study of the celebrity subject on desire as its reigning affect and motivator; as Graeme Turner writes in Understanding Celebrity, “From the celebrity’s point of view, their personal objective is most likely to be the construction of a viable career through the astute distribution and regulation of the sales of their celebrity-commodity.” And when celebrity theorists register a departure from this desire to be famous, they most often focus on extreme negative reactions to fame—the recoil of rejection–like Chris Rojek’s study of celebrities’ fear of what he calls “engulfment” by the “public face,” their sense of personal “extinction” that leads, he claims, to a greater-than-average incidence of “neurosis and mental illness.” But reluctance, which thrives in the interstices of these two extremes of desire and recoil, is fundamental to a more nuanced accounting of celebrity; many of Richard Dyer’s foundational insights on “stardom,” when examined closely, implicitly mine this most hybrid of affects: Stars, he argues, “articulate both the promise and the difficulty that the notion of individuality presents for all of us who live by it.” Promise and difficulty: crashing wave and undertow. In specific relation to Robert De Niro, reluctance as I am theorizing it has the power to explain why De Niro, for all that he is represented in the media as a fame-shy star is hyper-available in many other ways; he continues to make movies at a breakneck pace and to participate, at least to some degree, in the promotional work associated with those vehicles. Still, much of our published commentary on De Niro is locked in the past. Whether in the media or in academic analysis, we focus on the earlier, critically celebrated work — Raging Bull, The Deer Hunter, Taxi Driver — as though to repress the more recent roles thought to be distinctly down-market — Meet the Parents and its spin-offs; more recently The Intern or Dirty Grandpa. This is the De Niro that we don’t want to talk about because to do so would compromise our treasured image of De Niro as the up-market, critic’s darling who shuns the limelight. Except that he doesn’t — exactly. A theory of reluctant celebrity allows us to acknowledge and think through the implications of our critical partiality and the significant backlash that De Niro’s recent role choices, not to mention his promotional work for the likes of American Express, have unleashed. 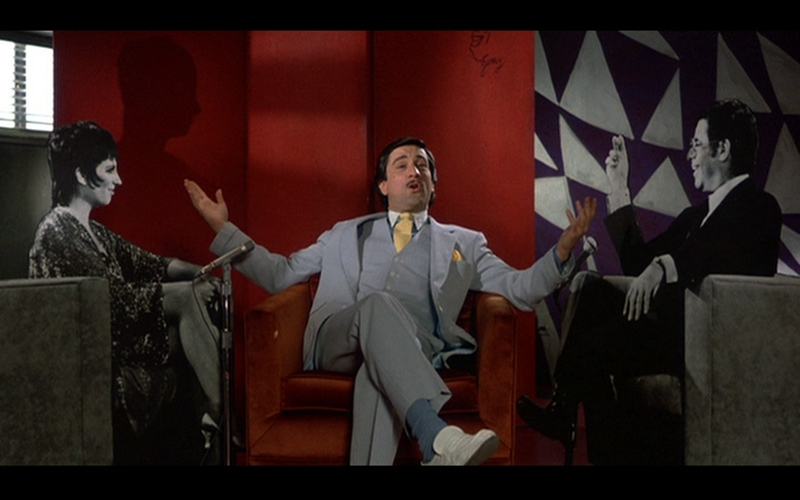 Screen capture from one of Martin Scorsese’s few comedies, The King of Comedy (1982), about Rupert Pupkin’s (De Niro) fascination and obsession with becoming a late night talk show host. In theorizing reluctance, I have wanted to distinguish it from reclusiveness, and this distinction has much to tell us about Robert De Niro’s performance of celebrity. 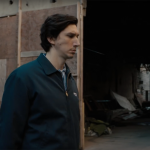 There are many observers who label him reclusive, though that seems deeply at odds with the public criticism he receives for being, on the contrary, too available, a pervasive presence on the Hollywood circuit. Alan Hunter in The Herald calls him “reclusive” because “he detests the limelight”; A.O. Scott, interviewing De Niro for the New York Times Magazine, goes nearly as far, citing the actor’s “extreme reticence.” Patricia Bosworth in her Vanity Fair profile places him in the category of “public recluse in the grand tradition of Marlon Brando.” This seems overdone even for an actor who guards his privacy as zealously as De Niro does. But as Greg M. Smith explains in a perceptive article, “Choosing Silence: Robert De Niro and the Celebrity Interview,” De Niro is being criticized for being available in the wrong way: physically, on-screen, through the body, rather than through a verbal promotional performance that slakes the need for a celebrity to, in Judith Butler’s terms, “give an account of oneself” and reassure us of the ontological viability of the “real” self underlying the celebrity image. I also note, though, that there are other critics writing around the mid to late ‘80’s when De Niro’s newfound success ran up against the obstructive wall of his reluctance, who have a nascent sense that the term reclusive, though it seems tempting, doesn’t quite fit De Niro. “Not reclusive but private” suggests Michael Pye in the Observer in 1988, and Jay Carr, the Boston Globe film critic, writing the same year, agrees: “not exactly … the Garbo of his generation, a recluse who wants to be alone, but he’s not interested in revealing himself.” Fred Schruers, who interviewed De Niro for Rolling Stone around the same time, called him “a man who’s not so much a recluse as an enigma”; De Niro readily agreed to this (rare) interview with Rolling Stone, but then postponed it several times and, when he finally did grant it, was, in Schruers’s words, “rigorously polite and just a bit threatening. ‘How did you like that answer?’ he asked with an odd mixture of defiance and contriteness after one effective evasion.” Agreement and postponement. Defiance and contrition. Behold reluctance at work: the propulsive movement through cultural space attended by its affective counter – current. All very speculative. But this latter point gestures towards another explanation that is far more promising: that De Niro’s silence correlates with his theory of acting. 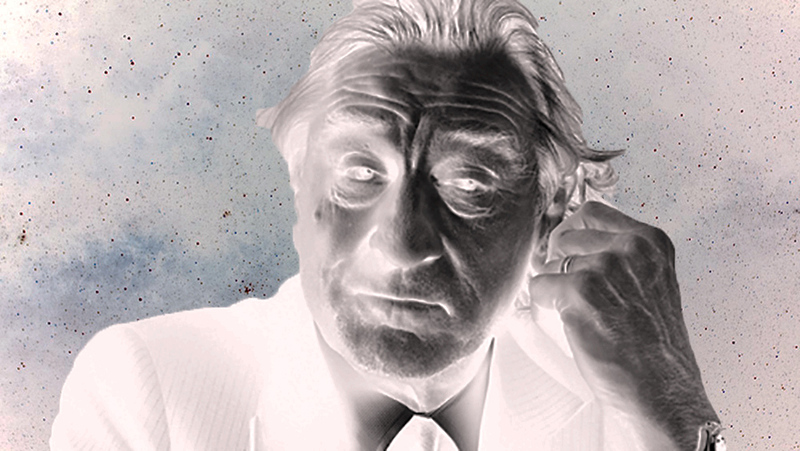 Barry Paris argues that, “De Niro’s sentences—his thoughts—are like his acting. 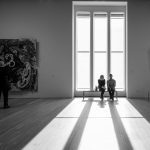 Grammar, syntax and vocabulary are all there, but not always in words.” This theory is supported by a much-shared clip on YouTube, “One Minute of Brilliant Acting Advice,” in which De Niro opines: “Actors tend at times…[to think that] they have to give it something: you don’t have to give it anything…You don’t have to do anything. Nothing. You’re better off.” In other words, don’t act that you’re acting: fairly common advice for theatre students. But it’s also a theory of affective minimalism that De Niro arguably applies to his performance of public subjectivity. Finally, there is the suspicious flip-side of this theory: that De Niro is performing taciturnity strategically, to amp up his star power. Greg M. Smith argues that “film stars have to trade increased privacy for control,” but De Niro’s silence allows him to avoid being discursively pinned down and thereby increases his ability to move fluidly and successfully within the film industry, as an actor, director and film festival founder. Methodologically, we reach for this theory whenever the motivational tangle of a celebrity subject eludes our analytical efforts, and we do so because it chimes in with the long-standing tendency to read all celebrity agency as instances of manipulation. All of this speculation about De Niro’s “silence” forgets the fact that there are many respects in which De Niro is anything but uncooperative; such theories only see the silence and forget the other crosscurrent of reluctant affect: the determination to move forward, to flow through cultural space. Greg M Smith rightly notes that, “In all the hullabaloo about what De Niro is ‘hiding’ from the press, one tends to overlook what is freely communicated to the interviewers.” And by that, he means the plentiful information about De Niro’s non-verbal, physical preparations for a role and the way in which they position his body as a site of discourse. I would go further, in that I would not divide De Niro’s reluctance into willing embodiment and unwilling verbalization. In the De Niro archives, held at the Harry Ransom Centre at the University of Texas at Austin, there is plenty of evidence of De Niro’s capacity to verbalize his acting choices; his generously annotated screenplays challenge the romantic notion of the non-verbal hyper-embodied actor. The reading of De Niro as the inarticulate genius needs this corrective of archival evidence; what looks like simple refusal is, instead, a reluctance that marries intellectual articulateness and a disinclination to produce it on public, promotional occasions. De Niro joins the cast of The Good Shepard at the 57th Annual Berlinale International Film Festival in 2007. The film was De Niro’s second attempt at directing. Beyond the archive, there is evidence aplenty of non-resistance, indeed, of eager inclination in De Niro’s star text. In his 2003 biography, John Baxter argues that the down-market roles De Niro has chosen in recent years help to fund his lower-Manhattan entrepreneurial projects, such as the TriBeCa film festival, condo developments, restaurants, celebrated by some as post-9/11 advocacy, decried by others as community-unfriendly. Beyond the economic functionality of those roles, I would also point to their eager embrace of the working life of an actor: good roles, bad roles, whatever comes along. I would also question the readings of De Niro interviews that only ever see the silences, hesitancies, and vacillations. A fuller hearing of those interviews discloses other moments, where verbally, affectively, De Niro like Garbo “speaks”: In an interview with Katie Couric to promote Silver Linings Playbook with the cast of the film, De Niro broke down and wept because he, like the film’s director David O. Russell, has a special needs child, though he did not share that information at the time. He is also verbally articulate in this interview; last year, De Niro showed himself articulate in another interview with Couric in which he spoke willingly on several subjects that are notorious no-go areas for him: his family, his marriage, criticisms of his recent career. Another interview with Al Pacino is positively rollicking, a kind of happy inverse of the infamous 2010 David Letterman interview in which De Niro was so taciturn that fellow guest Dustin Hoffman started to answer the questions that were directed towards De Niro. (Letterman ended the interview by assuring him, “Bob, I just want to say this is like jury duty, you won’t have to be here for another seven years.”).